Bellingham Politics and Economics: Fwd: Deadline Tuesday: Stop Coal Exports! 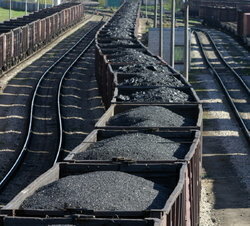 Subject: Deadline Tuesday: Stop Coal Exports! We need you to take action now to protect our communities from coal exports. Tuesday is the deadline to tell decision-makers that they need to consider your concerns about this important issue. Right now, Big Coal is proposing a 48 million-ton coal export terminal at Cherry Point near Bellingham, WA. If approved, it would be the largest coal terminal in North America and result in more than 6,500 mile-and-a-half long coal trains rumbling through our region every single year. That's a lot coal rolling through our communities, threatening our health, safety, local economies, and environment. Send a comment now and do your part to protect your family, neighbors, and community from dirty, dangerous coal exports. Even if Cherry Point is a long way away from your community, you will likely see impacts right in your own back yard! Coal dust and diesel particulates will damage our air and water quality. Increased rail traffic will delay emergency response at train crossings and impact local businesses on main street. Fishing and agriculture will be harmed by coal train pollution and exporting tons of coal overseas will accelerate climate disruption. Send a comment now and make sure impacts from coal exports in your community are considered before any decision is made about building the Gateway Pacific Terminal at Cherry Point. Even worse, Big Coal doesn't think you deserve a say in this project -- it thinks only the site at Cherry Point should be studied. However, in communities across the region, from Billings, MT, to Sandpoint, ID, to Spokane, WA, to the Columbia River Gorge all the way to Bellingham, we will all be affected by coal bound for this terminal and beyond. Decisions that will impact our way of life for generations are going to be made and we cannot afford be left out of the process -- too much is at stake. Join with thousands of people in Montana, Idaho, Oregon and Washington in this grassroots movement against dirty, dangerous coal exports. Send your comment today and protect your family, neighbors and community from the dangerous Gateway Pacific Coal Exports Terminal proposal!